The Rapattoni Drama Scholarship is awarded annually for Outstanding Performance in the Chaffey High School Drama department. 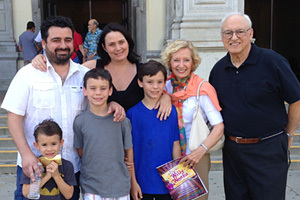 Scholarship co-founding providers, Niki Brown Rapattoni (CHS class of 1958) and her late husband Andy Rapattoni (CHS class of 1957), met in the high school auditorium in 1956 while attending their senior play. They became high school sweethearts, were married 55 years, and in business together for 45 years. Niki says, "Going to Chaffey High School in Ontario, California, in the 50s was like stepping onto a movie set. The 65 acre campus of big ivy-covered buildings at the foot of Mt. Baldy remains a showcase today. The Gardiner W. Spring Auditorium on campus seats 2,200, has a dome-shaped ceiling, classic opera boxes, and a state-of-the-art sound and control system. The drama department, managed by David Masterson, Chair of the Visual and Performing Arts at CHS, is exceptional and they produce two musicals each year that rival Broadway." They have been supporters of the CHS Alumni Association (Andy was the 2010 CHS Alumni Tiger of the Year and spoke at the CHS Baccalaureate ceremony) and are annual benefactors of the CHS Drama Department. "Our objective in establishing and awarding this scholarship to the CHS graduating student that has excelled in drama and plans to continue their education in theatre, is to provide help and encouragement for heading off to college or university," said Niki Rapattoni. "I greatly appreciated the scholarship I received when I graduated from Chaffey College that paid for my books and supplies my first year at the University of Southern California. 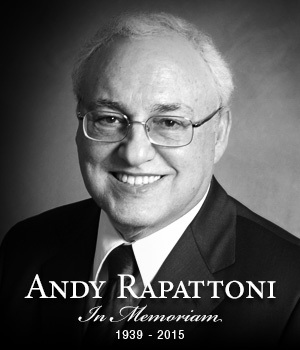 A heartfelt thank you to the many who have contributed to the Rapattoni Drama Scholarship in memory of Andy Rapattoni. This fund can now support scholarships for many years to come and help the Chaffey High School Drama Department continue to produce outstanding shows." To learn more about the Chaffey High School Drama Department and to view a calendar of upcoming performances, click here. In honor of Andy Rapattoni, donations may be made to the Rapattoni Drama Scholarship Fund through the Chaffey High School Alumni Association.